LOWER PRICE AVAILABLE FOR MAXIMUM 16 PEOPLE, PLEASE ENQUIRE. We are delighted to have found this Tuscan retreat, ideal for family reunions/weddings/events. The facilities at Villa Monticiano are above and beyond those offered in most large luxury rentals - large infinity pool with stunning views, modern take on traditional Roman baths with an outdoor calidarium, frigidarium and tepidarium all with panoramic view, cinema room, wellness centre with Finnish sauna, yoga room and gym, Wifi, air-con, professional astronomical observatory where an astronomer will come once a week to talk our guests through the night sky... The list goes on! Staying at Villa Monticiano is more than a holiday, it is an experience to remember forever. 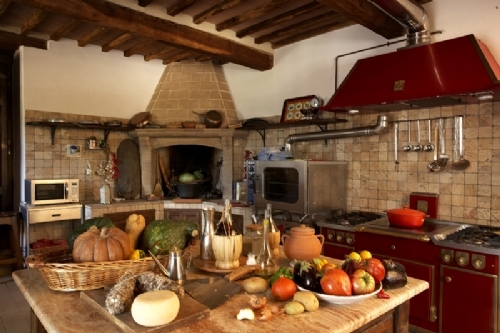 All three daily meals are available upon request - typical Tuscan cuisine with products from the large organic vegetable garden and livestock raised on the estate, such as pigs, cows, sheep, goats and trout. Sleeps 27 in 14 bedrooms all with en-suite. Full concierge service available. Siena & Montalcino (with its' wonderful wine!) nearby. Once a hamlet dated back XII century, now after a long restoration a luxurious villa among the hills of the Tuscan countryside. This villa is located in the valleys of the Merse River, in the south of the province of Siena, not far from Montalcino and San Galgano Abbey. In a wonderfully tranquil location surrounded by thousands of hectares of forest we found this luxurious villa among the Tuscan hills, not far from Siena. 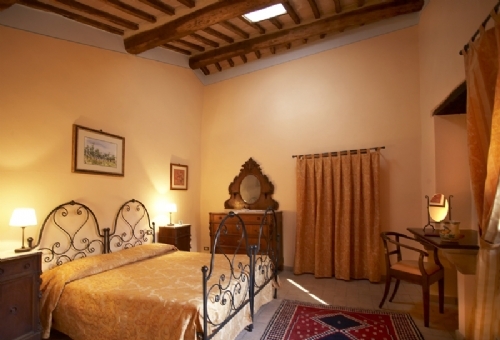 The villa is furnished to a high standard in the Tuscan style: terracotta tiles, wooden beams, wrought-iron and a wonderful combination of colours. The villa is able to accommodate comfortably twenty-seven adults in 14 bedrooms, all tastefully furnished with antiques. Each bedroom has its own en-suite bathroom with tub and handheld shower. In the extensive gardens there is a large, infinity swimming pool (20 m long /1,6 m deep) overlooking the wooded valley,the lawn surrounding the pool is dotted with umbrellas, sun beds, and chairs. A large sunny panoramic terrace, furnished with wicker sofas and armchairs, overlooks the Roman Spa baths and there is a vegetable garden within the grounds. Ideal for friends on vacation or destination weddings for gatherings of stargazers, yoga courses or incentive groups, for managers who need to recharge their batteries, for team building programmes, small-scale meetings or original events. Villa Monticiano is a small hamlet of three adjoining buildings, in which the bedrooms are located, many of them opening off cosy seating areas: here guests can sit on comfortable sofas by the fireplace to read, listen to music or sip a good Tuscan wine. Refined in their simplicity, all the spaces combine tradition and luxury: flat-screen TV with satellite links, fast internet connection, linen of local manufacture, toiletries made from olive oil, private bathroom with shower and/or tub, hairdryer, under floor heating supplied with hot water from a biomas-fuelled boiler and solar photovoltaic and thermal panels, as well as a "cellar-effect" cooling system, again located under the floor (on request). Air conditioning is also available on request and at an extra charge. From this privileged position it is possible to probe the sky with the superb technology of a professional observatory: a Meade LX 200 R14'' f/10 telescope with GPS; CCD camera for deep-sky shots of the planets and moon with direct link to a maxi-screen; fibre optic network connected with the conference hall; meeting room with a capacity of twenty-five and fast internet connection. A unique feature of this place, the observatory has been selected by the U.A.I. (Italian Union of Amateur Astronomers). Please note the astronomer must be arranged in advance. - Wireless internet connection plus the use of an internet point in a common room.